We are specialists in scrapping all types of vehicles, including Mercedes cars, that have come to the end of their life. We pay instant cash regardless of the condition or model of the Mercedes and we pick up them up on the same day to dispose of them in an environmentally friendly way. Scrap a Mercedes ML for cash with Scrap Car Kings. Is your Mercedes-Benz malfunctioning mechanically or electrically? Does your Mercedes have a blown engine, or is the transmission slipping? If you’re thinking to yourself “I really need to scrap my Mercedes ML quickly” then Scrap Car Kings can help. We buy vehicles in a variety of conditions. So if you have a new Mercedes with body damage or an older model with a bad engine, Scrap Car Kings will buy your damaged, broken-down or un-used Mercedes-Benz. Introduced in 1997 with the 1998 model, the Mercedes ML – also known as the M-Class – is the pioneer of the high-end SUV market. Its chunky and muscular design quickly captured the public imagination and spawned a number of rivals. American in spirit, the Mercedes ML has gone through three design generations, and has been built in Alabama since 2002. From the outset, the Mercedes ML showcased a number of ground-breaking technologies. All vehicles featured side-impact airbags with automatic detection for the front passenger seat. 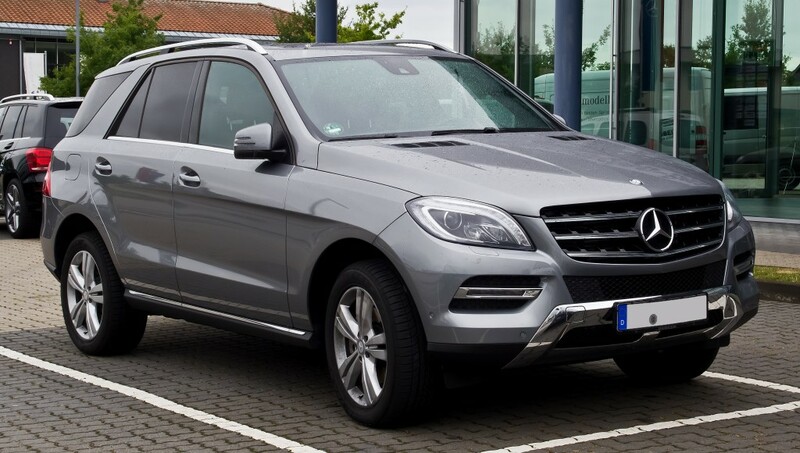 The Mercedes ML was also the first SUV equipped with electronic stability control, a feedback system using automatic braking to restore controlled driving conditions. Though 150 mm longer than its predecessor, the second-generation Mercedes ML has a completely redesigned, more aerodynamic body. This generation of the ML addresses the significant problems with the vehicle’s overall quality and remains a popular choice. In 2008, Mercedes-Benz introduced their Blue Tec diesel engine to the ML range. For those who love a bulky body and a comfortable interior, the Mercedes ML is a seductive SUV. It is comfortable, reliable and safe, doesn’t suffer from any common faults, and has never undergone a safety recall. However, with earlier models being more expensive to run and with sky-high bills for unscheduled maintenance, there eventually comes a point at which your Mercedes ML stops being a good investment. That’s the point at which it makes perfect sense to talk to Scrap Car Kings about scrapping a Mercedes ML. Are you looking to sell your Mercedes? Scrap Car Kings provides a fast and safe way to sell your Mercedes with no hassle at all. Simply fill in the form on the homepage and receive a FREE quote. Once you have accepted the amount, we will transfer the funds straight into your account and collect your Mercedes the same day – it’s as easy as that! We buy all makes and models of Mercedes-Benz, regardless of age or mileage. There is no faster or efficient way to sell your Mercedes-Benz! Enter your Mercedes details online today for a quote and scrap your car today.